Happy Memorial Day weekend – it’s officially summertime!! The weather around here is finally cooperating and this last weekend was the first weekend this year where we had full on sunny warm weather – it was a dream! I wore shorts for the first time this year if you can believe that and felt a little naked 😉 but finally got some sun on this skin. I can’t wait to finally have a tan going and I’m ready to fully embrace these summer months. 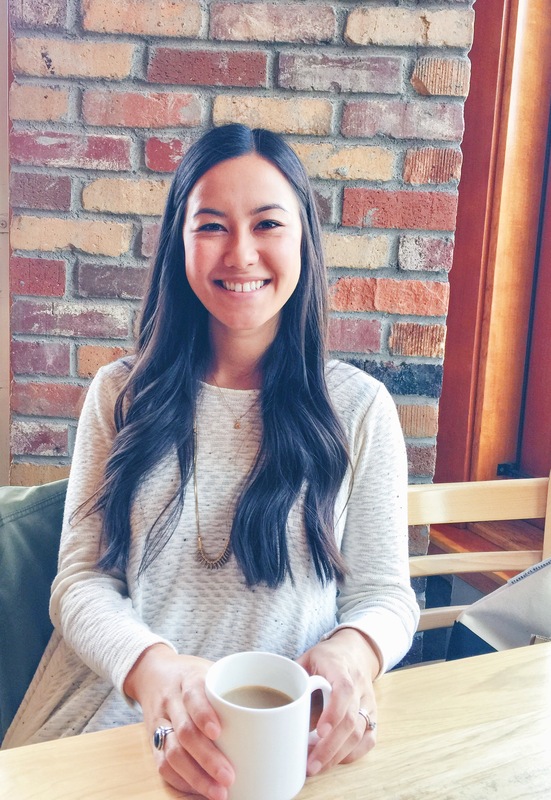 We’ve got some fun plans this summer and I am so looking forward to them – lots of lake time, family time, a trip to CA (I haven’t been in almost a year! ), and wedding festivities galore. To start the summer off on the right foot we’ve been bbq-ing it up a lot lately and one day a few weeks back I was craving these Grilled Jalapeño Poppers. I hadn’t made them in forever but they are a perfect summer appetizer and so easy to put together. If you love grilling, a little spice, bacon and cheese these are the perfect appetizer to make for a warm summertime afternoon. 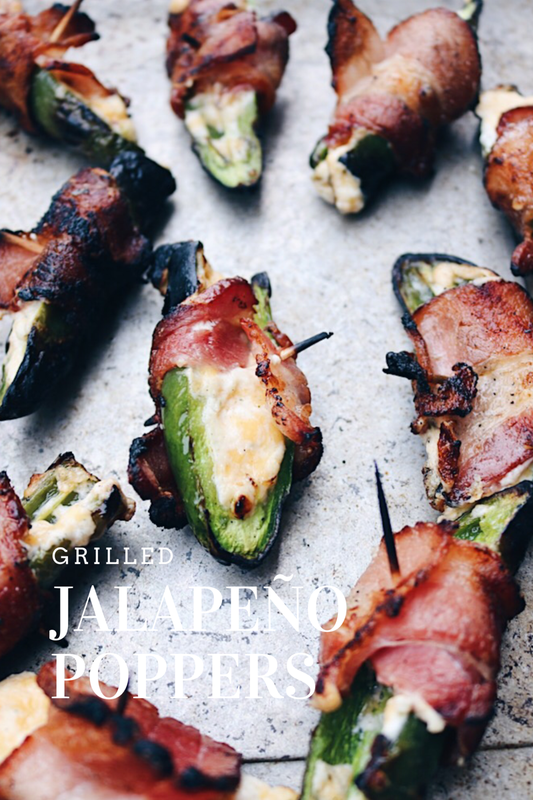 These Grilled Jalapeño Poppers have so much flavor and grilling them brings them to another level. Did I say they’re easy to make already? Because they totally are! Slice your jalapeños in half and clean out the membranes and seeds (those are the spicy parts), mix up a cheesey filling of cream cheese, cheddar cheese and ranch dressing seasoning, stuff those peppers, wrap them in bacon, and grill to perfection. The bacon gets crisp and charred, the peppers soft with the perfect amount of spice and who doesn’t love melty cheese? I’m just saying these are going to be your go to summer appetizer if you’re into anything I’ve listed above. 🙂 The only thing to make these Grilled Jalapeño Poppers any better would be some sunshine, a cold drink (I’ll take an ice cold Grapefruit Shandy), and probably a little Zac Brown Band playing and you’ve got it made! At least I know that’s what we’ll be up to most summer nights. 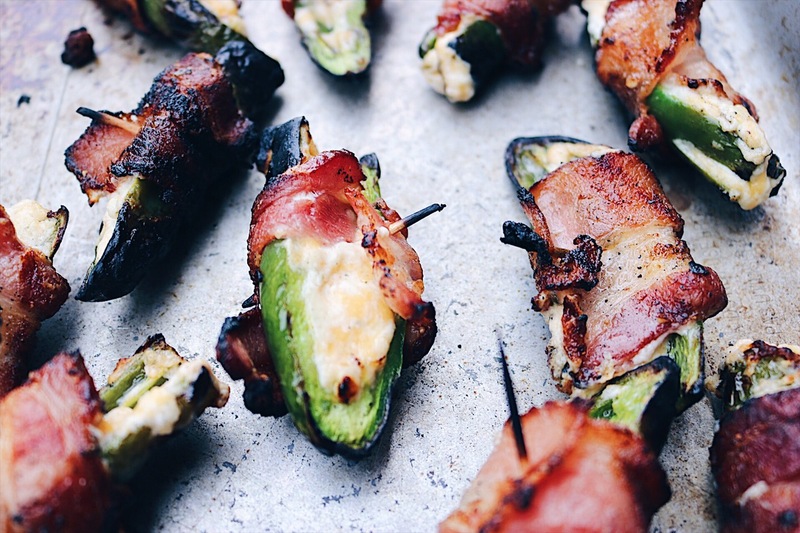 Grilled Jalapeño Poppers wrapped in bacon and filled with a melty cream cheese cheddar filling! 4 ounces light cream cheese, at room temp. Before you begin prepping your jalapeño poppers, soak your toothpicks in some warm water for about 20 minutes so they don’t burn while you’re grilling the peppers. To prep the jalapeños, wash them and cut off the stems. Slice them lengthwise and remove the seeds and white membranes with a spoon. You can wear gloves while prepping these, but I didn’t and didn’t have a problem but it couldn’t hurt especially if you have sensitive skin. Next in a medium size bowl, mix together the cream cheese, cheddar cheese and ranch seasoning mix until it’s thoroughly combined. 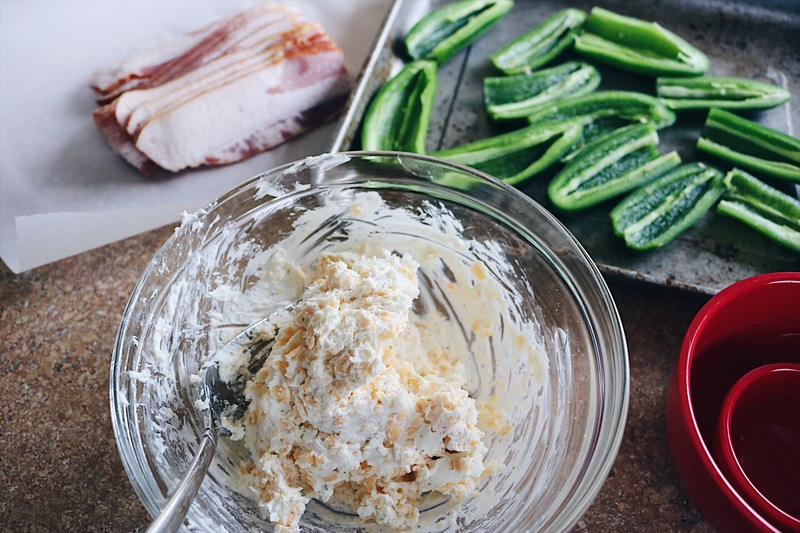 Fill each jalapeño halve with a small amount of the cream cheese mix and press into the peppers so it fills the entire pepper and is leveled. Next cut your bacon strips in half cross wise. 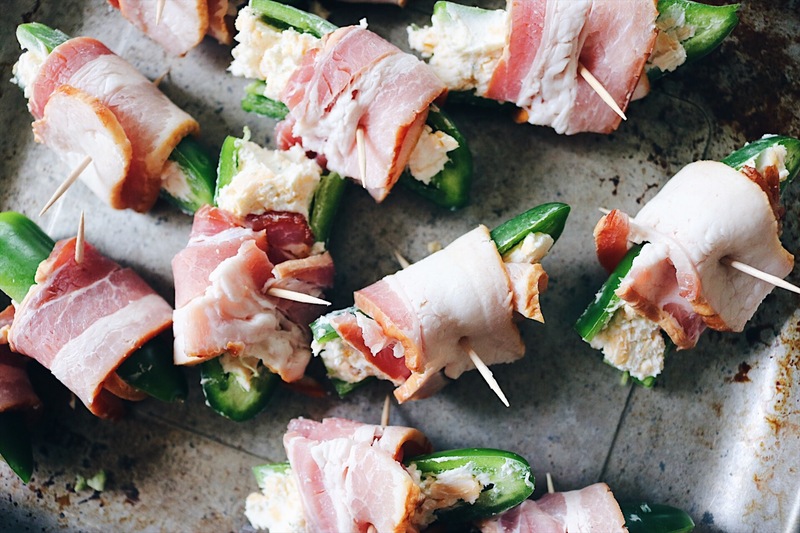 Wrap each cheese filled pepper with a half-slice of bacon and fasten with a toothpick. Heat your grill to medium-high and cook your stuffed jalapeños for about 15-20 minutes, turning them frequently – try not to let them cook face down for too long or you’ll risk your cheese filling melting out. 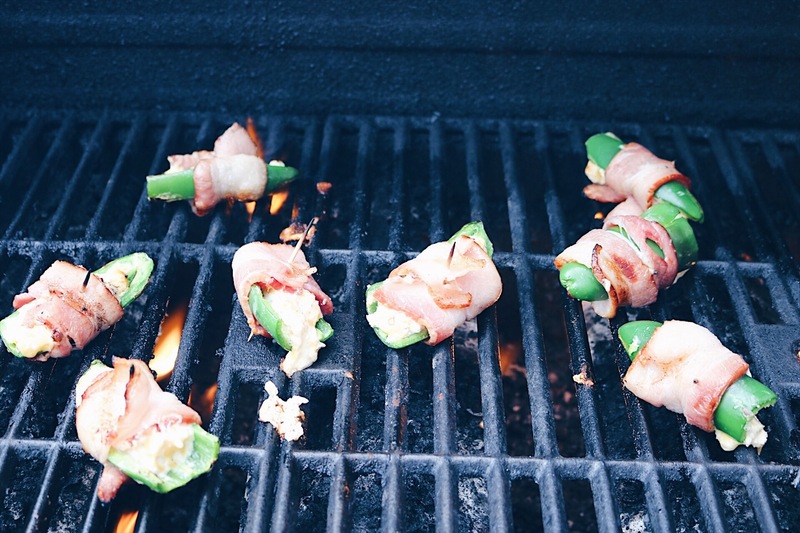 Grill them until your bacon is crispy and the peppers are soft. You can find the ranch dressing mix in the salad dressing aisle, it comes in those dressing packets. For crispier bacon and a quicker grill time, use thin cut bacon – that’ll help reduce the grill time so your cheese filling doesn’t melt out. Hope you have a sunshine and BBQ filled Memorial Day weekend ahead of you! Don’t want to miss a post or recipe? Subscribe to email updates or follow along on Instagram or Pinterest!